Gardeners and lawn enthusiasts know that late summer and early fall are a great time to give their plants an extra boost before winter begins. Your worms have been busy all summer breaking down kitchen and garden scraps. Now is a great time to dig in and harvest some “black gold.” The bottom level of your worm bin has seen the most worm action, so that’s the place to begin. If the material at that level looks like topsoil and has very few worms, then it’s ready to be used. (If you still see some eggshells or other hard materials, that’s ok, you can pick them out.) Depending on how busy your worms have been, what you are seeing may be vermicompost or it may be straight worm castings: If you have pure worm castings, the color and texture will be crumbly and rounded throughout. 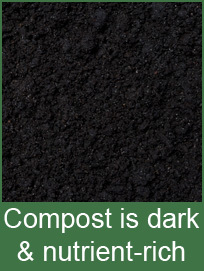 If you have vermicompost, the color may be evenly dark, but the texture will vary. Both are filled with nutrients for your plants. Those nutrients are easy for your plants to absorb and yet so stable that they may be available for as long as five years! In addition, neither will burn your plants. Bedding is an essential part of your worm bin and often the key to your worms’ health and happiness. You will need to add bedding when you start a new vermicomposting bin, pile or trench. Fresh bedding can help if something has gone awry in your worm bin (see “Sick Worms”). If you need to harvest a lot of worm castings, you have the option of adding bedding to your worm bin. Bedding allows the worms a fresh environment, proper moisture, and room to breathe and move. Worms also eat bedding, so it has to be safe material. Here we’ll discuss some materials for worm bedding and how you should use them. Do you know everything about your wiggly friends in the bin or garden? With their simple life underground, worms can remain mysterious creatures! Let’s open a can of worms and answer some popular questions about the life of a worm. Q: Do worms have mouths? A: Yes! A worms mouth is located in the first segment of its anterior (front) end. When the anterior end contracts, the mouth is covered by a very small and sensitive patch of flesh called the prostomium. Then, when the worm looks for food, the prostomium can stretch out, sensing suitable food particles and allowing the mouth to open wide to take in a surprising quantity of food. This is why your worms can eat up your food scraps in no time! From time to time, you might find some other critters vying for space with your worms in their bin. It’s important to identify and eliminate harmful pests before they can multiply or harm your worms. Below are some common critters you might find: millipedes, centipedes and mites. Find out what they’re doing in your bin, and ways you can best get rid of them. Millipedes Millipedes are big, rounded wormlike creatures with their defining set of hundreds of tiny legs (though their name means “1000 legs,” it’s usually more like 400). They are slow-moving creatures that usually live in soil or plant matter. Most range from a half inch to two inches long, and their main duty is eating dead and decaying plants. Though millipedes look a little creepy, almost all species are actually beneficial to your garden and harmless to your worms! They are not true pests. You’ll usually find them in the bin if you’re using composted plant material or manure for bedding. They are only there to perform the same job as your worms by breaking down organic matter. There is no need to remove or kill them, but if you’d rather not have them there, it’s easy to pluck them out by hand without any harm to you or your worms. What Do I Do If My Worms Are Sick? Worms don’t need much to stay healthy and happy, but occasionally bad things happen. Just like humans, worms respond to changes in their environment. Sometimes the conditions in your worm bin may have become unintentionally harmful to your worms. What do you do if your worms appear to be sick or dying? Fortunately, there are some simple measures to take. What to Do: If you notice that some your worms are dead, act quickly to save the remaining worms with these steps: Move worms to a new, clean bin. Even if you don’t have another designated worm bin, clean and use whatever container you have on hand. In the future, keep another bin around in case of emergency. Replace bedding with something neutral like shredded newspaper, clean leached peat, or something you know your worms have liked in the past. Clean and check your old bin for any of the trouble signs below before returning your worms to the bin. 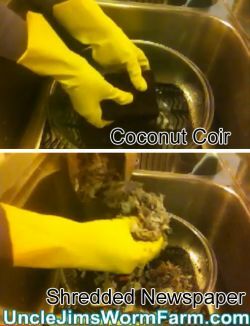 What are the best ways to add compost from vermicomposting to your garden? Vermicomposting is composting with worms. “Vermis” is Latin for worm. Composting can be done without worms, but worms accelerate and enrich the process. They generate rich, dark brown humus. This “black gold” is a super-food for plants that enhances soil porosity and nutrient content. Humus helps produce strong, healthy vegetation in abundance. At Uncle Jim’s Worm Farm, we recommend our Red Wiggler worms for vermicomposting. Humus works in a number of ways. It forms loose particle aggregates which make soil “crumbly”, which means the soil retains moisture while enhancing oxygen flow. Since plants depend on both water and free oxygen to develop, they do not do well in soil that is too compacted or too dry. Adding humus to clay, sandy soil or other types of difficult growing terrain increases porosity, which makes it much easier to grow successfully.